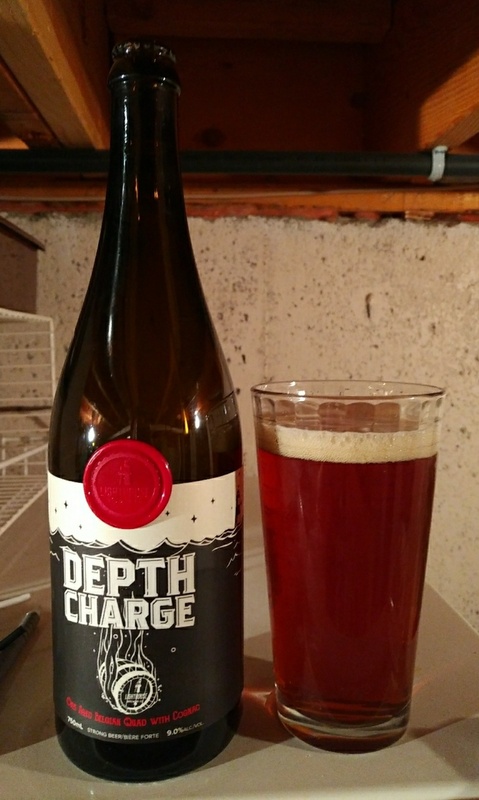 From Victoria’s Lighthouse Brewing comes their “Depth Charge Oak Aged Belgian Quad with Cognac”. Last years version was a scotch ale. The beer pours a reddish brown colour with a tan head. The aroma consists of cognac, candi sugar, dark fruit, banana, sweetness and some oak. The flavour is of dark fruits, cognac, candi sugar, caramel, vanilla, banana, citrus rind, sweetness, mild bitterness and alcohol. There is a slight harshness in the finish that would die off with a bit of time in your cellar. The alcohol content comes in at 9% with an IBU of 22. This is a fantastic brew with a ton of flavour jumping out at your mouth. Commercial Description: Belgian yeast provides a spicy backbone to the rich cognac and oak flavours of dark fruit, caramel, vanilla and toasted bread. Best enjoyed in bad weather, shared with family and friends, or aftter cellaring. 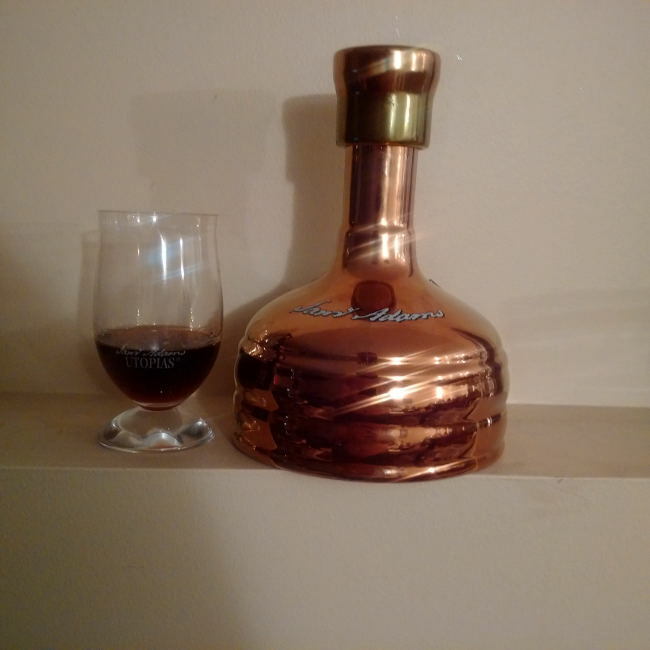 From Samuel Adams out of Boston Massachusetts comes the Holy Grail of most beer nerds “Utopias” 2013 Vintage (also the most expensive beer to date). This beer destroys your perception of what a beer is as not only is it uncarbonated but it is also 28% alcohol and is a blend of beers some of which have been aged in barrels for up to or more than 20 years! This years edition has been aged in Bourbon barrels, 8 year old port barrels and rum barrels and the finished product is blended together with a small amount of their beer the Komsic Mother Funk. Before you pour this beer understand it is not meant to be refrigerated and should be served at room temperature in one or two once pours. The beer pours a deep brown colour with absolutely no head which makes sense as this is uncarbonated. The aroma consists of maple syrup, cognac, whiskey, booze, vanilla and some dark fruits. The flavour is of maple syrup, dark fruits, vanilla, cognac, whiskey, alcohol warmth, chocolate, cherry, earth, brown sugar, rum, butterscotch, toffee, honey and plums. This is a huge beer at 28% and there is no doubt when you drink it. I still really enjoyed this beer although I have to say that there has not been a huge change over the last year since I tried this last. Commercial Description: Utopias is brewed using traditional methods. The brewers begin with a blend of two-row Caramel and Munich malts that impart a rich, deep amber color. Noble hops – Hallertau Mittelfrueh, Spalt Spalter and Tettnang Tettnanger – are also added to lend complexity and balance. During fermentation, several yeast strains are used, including one normally reserved for champagne. The beer is then blended with a variety of different brews, some of which have been aged in different wood barrels for more than 20 years. As a result of the blending and aging, Utopias invokes the flavors of a rich vintage Port, fine Cognac, or aged Sherry while feeling surprisingly light on the palate. 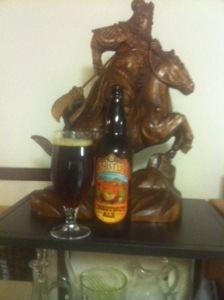 Steve’s Twelfth Beer of Christmas comes from Whistler, BC: Whistler Brewing’s Valley Trail Chestnut Ale. I have saved my absolute favorite beer for last. First: if you have never had roasted chestnuts go out and do that right now or this will not make sense. It is worth it. This is actually a Fall beer but I tend to drink it at Christmas. A pleasant burnt honey colour to the body and a white head with a brown tinge. The nose is all chestnut and really rolls through the nose bringing a very Fall/Winter feel. Make sure to take air in with your first sip and a light cognac flavour. This beer has a great flavour, chestnut and caramel maltiness along with several subtle bitter notes. I honestly can’t do this beer justice through text and words. Try it.